Kurtz Construction Company was first established in 1971 as Steve Kurtz Roofing to provide residential roofing services in Chestnut Hill, Mt. Airy, Germantown, and the near Eastern Montgomery County suburbs. The company has since expanded both its area of service and its fields of expertise. Kurtz Construction now provides expert advice and high quality craftsmanship in all current and historic roofing applications. Kurtz Construction specializes in diagnosing problems, proposing solutions and implementing appropriate reroofing or repairs. 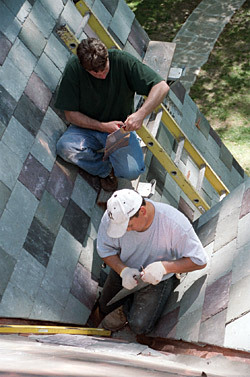 Often times, customers are surprised that re-roofing is not the choice we recommend. Instead we look for the least invasive solution to the problem, which is generally better for the building, less costly for the customer, and better for the environment. The company has a long history of working to meet the most rigorous specifications demanded in architectural preservation projects. At the same time, the company keeps current on the most innovative modern materials and applications available to the industry, up to and including the installation of green roofing systems. The area of service provided by the company has expanded throughout the entire Delaware Valley Region.